Those peoples who are now known as Indo-Europeans (IEs) were the most widely ranging ethnic group in ancient times. 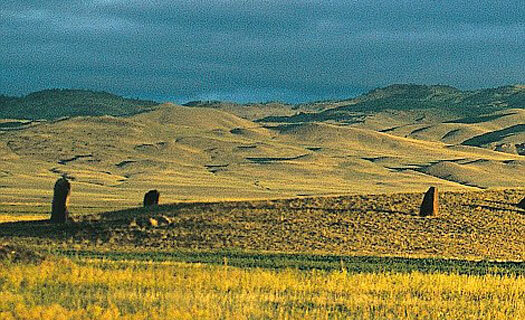 Due to their existence on the steppes as cattle and horse raising people, they were quite mobile - a characteristic which they shared with other steppe nomads such as the Turkic and Hunnic peoples. Indo-European is proposed to be a member of a much older macro family called Nostratic. This includes the Uralic, Altaic and Kartvelian languages, and with a lower probability also languages spoken in India, North Africa, and the Arabian peninsula. Kartvelian-speaking tribes would have been close neighbours to the original Indo-Europeans in the Caucasian Mountains - the apparent difference between them would be that Kartvelian speakers stayed home in the mountains, while Indo-European speakers expanded. This expansion was almost certainly caused by the adoption of horse-drawn wagons by the Indo-Europeans. This led to led to the use of chariots in war, and finally to riding horses for various purposes. There are various theories about the precise location of their original homeland. A personal leaning is for the most probable theory, that they were originally located somewhere on the northern edge of the Caucasus Mountains. These form a range of peaks that sits between the Black Sea and the Caspian Sea and which today is largely within the borders of Georgia and the southern tip of Russia. The IEs then expanded out from there, most of them going north into the steppes. A full timeline of events can be seen in the accompanying list (see link in the sidebar, right). But a brief recap here would be useful. The separation of the proto-Indo-European (PIE) language from its parent Nostratic tongue took place approximately at the 6000 BC mark (see the first map, above). The beginnings of Indo-European expansion took place around 4000 BC (see Map 2, below), and with it the beginning of areal dialects. The Anatolian dialect began to move southwards, signifying the migration of one group of Indo-Europeans away from the rest. 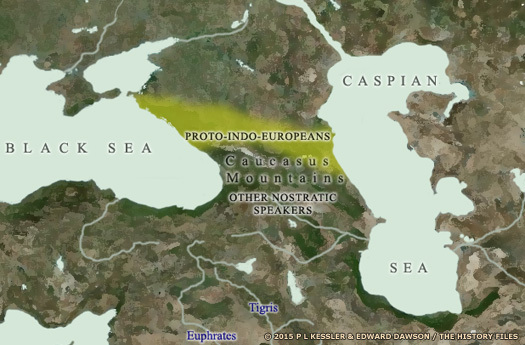 Most of the others appear to have begun an expansion northwards into the Pontic-Caspian steppe. Was the horse domesticated and the horse-drawn wagon adopted at this time? 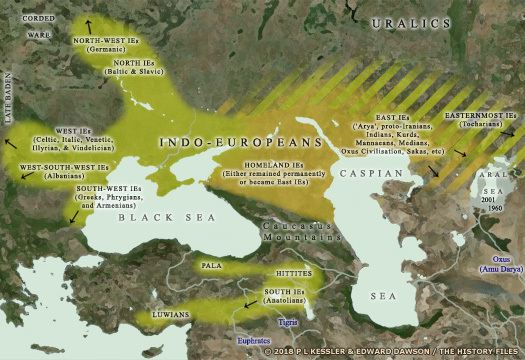 This is the Kurgan Hypothesis homeland period, also known as the 'Pontic Steppe Hypothesis', with the majority of Indo-Europeans inhabiting the steppes to the north of the Black Sea and Caspian Sea. The archaeological evidence so far is too inconclusive to provide a definite source of origin for the Indo-Europeans, and some of the more outlandish theories place it far away from this region, but the Pontic steppe is the favoured theory. 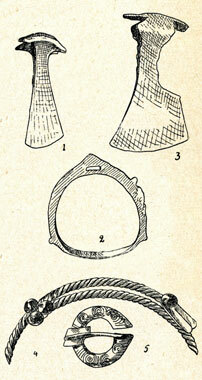 These early Indo-Europeans were identified by scholars with warrior pastoralists who built kurgan (burial mounds - a Turkic loan word in Russian which is often used to identify the Indo-Europeans prior to their expansion) in the steppes to the north of the Black Sea and Caspian Sea in what is now southern Russia and Ukraine. However, the core of this particular study focuses on the expansion as shown by language shifts rather than other means. The Kurgan Hypothesis homeland theory is the dominant theory to explain the migrations of Indo-Europeans and the early cultures that they formed. Areal dialects are a common language that is spread over a division of areas and spaces with regional differences emerging. The Anatolian branch of Indo-European language appears to have separated from the rest around 3500 BC; it retained many archaic features which were lost among the other branches of Indo-European, indicating a clear separation between the two branches at this time (south and north). The ancestor tongue of Hatti (Hittite), Luwian (many sub-branches), Lydian, and Palaic migrated from the Indo-European homeland and moved south through the mountains. Eventually it reached the highlands of the Anatolian peninsula. From there the Hatti speakers (Hittites) manage to form an empire that encompassed most of Anatolia (although they were much later in establishing themselves than the Luwian-speakers). Around 3000 BC, the remaining Indo-Europeans (now excluding the Anatolian branch) probably began the process of separating into definite proto languages which were not intelligible to each other. A western group would evolve into the Celtic, Italic, Venetic, Illyrian, Ligurian, Vindelician/Liburnian and Raetic branches. Early in this western group's expansion, one tribe apparently made a U-turn and headed eastwards (which is easy enough to do when you are a steppe nomad!) to evolve into the Tocharian branch of Indo-Europeans. A north-western branch began the German ethnic group. A northern branch founded what would become Baltic and Slavic peoples. Proto-Greeks formed a south-western branch, probably along with Thracians, Dacians, and Phrygians, all of which seem to have been related to the Armenians. An eastern, or 'stay at home' branch apparently calling themselves Arya or something similar formed the ancestors of Indians, Kurds, Iranians, Mannaeans, Medians, and related peoples. There are two theories about the splitting of the proto-Indo-European language (PIE) into divergent languages. One is the tree theory, which illustrates them separating like the branches of a tree. The other is the wave theory, which indicates dialects in contact influencing their neighbours. Both theories would seem to be correct to some degree. In truth both would have happened depending on the degree of mutual contact and/or isolation. Furthermore, there is evidence that branches which split apart in the manner of the tree model can adopt a linguistic trend or custom from each other. One of the most glaring examples of this would be the shift from PIE's ancestral 'kw' sound to 'p' in both Celtic and Italic tongues across a central area of Europe, something that was not adopted by geographically-isolated Celts in Spain and Ireland, or those Italics to the west of the Pennines. Another is the satem/centum split. For convenience, and no other reason, the tree model is used here. Whilst it is generally too simplistic for a complete explanation, using a wave model would make the branches incoherent. The 'leading edge' of the Balto-Slavic group seems to have become proto-Balts, and their southern relatives, proto-Slavs. These two moved north from the other Indo-Europeans, or were already somewhat to the north of them anyway, semi-isolated forest-dwellers. They appear to have moved into (or remained largely located within) forested river valleys during the early stages of IE migration and, if they ever had it, gave up the semi-nomadic or fully nomadic lifestyle as a result. The proto-Germans migrated into southern Scandinavia and the Jutland peninsula. Some peculiarities that distinguish proto-Germanic from other Indo-European tongues may have been borrowed from Finnic languages. There also appears to have been heavy cultural contact with their neighbours to the immediate south, the Celts. 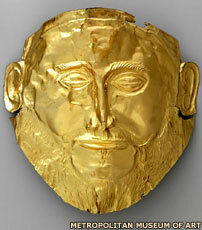 They borrowed at least one deity (Taranis, better known as Thor). They also appear to borrowed a prominent peculiarity of pronunciation that was associated with the Celtic influence on their religion. The Celtic 'gw' or 'gu' instead of 'w' was adopted in speech, so that the word for a magician, 'wod/woth', became 'god/goth', meaning a deity. The 'gw' became 'g' and, in at least one recorded instance, a 'k', as the Baltic Sea was recorded by the Romans as the Codanus Sinus. There appears to have been two conflicting groups of deities who were honoured by early Indo-Europeans; these are best known by their Vedic names of Devas and Asuras. Some cultures honoured both, but most chose one or the other as dominant one. The proto-Germans seem to have chosen the Asuras as dominant, under their dialectal variant 'Os', otherwise known as 'Aesir'. This language group dominated most of Europe in ancient times, and still does in Western Europe. Its member languages are Celtic, Italic, Venetic, Illyrian, Ligurian, Vindelician/Liburnian, and Raetic branches. West Indo-Europeans are probably best known for their geographically wide-ranging group, the Celts, who in turn adopted Latin once they had been conquered by the Romans. This group's most influential member language, however, is Latin, an Italic tongue that was spread across Europe by the Roman empire. Celtic tribes have been associated with Urnfield culture artefacts that began to appear around 1200 BC in central Europe, with the later Hallstatt culture which started around 800 BC, and also with the La Tène culture of around 450 BC. Whilst these associations are not doubted here, readers should be cautious about merely accepting these defining labels. Celtic-speaking tribes were not limited to the regions within these material cultures and instead extended well beyond them. On the other hand, the Hallstatt material culture was also found in the Illyrian area of Eastern Europe, showing a wide range of settlement. Movement of this group appears to have been almost exactly west from the ancestral homelands, with some bending of their path due to geography. A serious question would be why they came west. Were they pushed by other nomads, and if so, who? Peoples in the area might have been Iranian nomads or perhaps Thracians, such as the Cimmerians who originated on the steppes before moving south into Iran and Anatolia. Albanian appears to be an Indo-European dialect isolate. Its affinities appear to make no sense whatsoever, so the less said here about it the better. Any help in this area would be appreciated, so please get in touch. Whoever or whatever they were and are, they occupy the western coast just north of the Greeks. This term refers to the east/west split (respectively) in Indo-European language groups. The satem described all of the eastern IE language groups, and centum the western. This is discussed further in the 'Easternmost IEs' section, below. This language group seems to include both Greeks and Armenians; whether they split off from a more recent common ancestor than PIE, or were in close contact is debatable. Also in this area were the Thracians, but their origin is even more debatable because they appear to have spoken a satem language rather than the centum one of their neighbours. A tidy assignment of their origin is impossible due to the uncertainty of their history. Were they a West IE people, perhaps Italics or Illyrians, who were taken over by an eastern, satem-speaking military elite, with their languages subsequently fusing? Also tentatively placed in this group are Dacians and Phrygians. These are the Anatolian languages, the first to split off from PIE. The best known is Hittite, which also included Luwian, Palaic, Lydian, and Lycian. This is the group that appears to have abandoned the steppes at the earliest date, and yet historical records indicate that they had the same highly mobile horse-borne habits as the other Indo-Europeans. They fought from chariots and attacked south from Anatolia into Mesopotamia and Egypt. The Tocharians appear to have a very odd history. Their language shows elements of both eastern and western influences, which raises the question of whether they began as a Western IE group (or a conquering core of Western IE warriors) that went eastwards and either assimilated another tribe or other tribes, or were in heavy contact with them. A case could even be made for them being an Anatolian language group or being in heavy contact with the Anatolian group. An intriguing possibility is that they are a hybrid people made up of elements of multiple groups. The curious thing about Tocharian is that it is a centum language - just like IE languages in the west - but it is the easternmost of the IE languages. This is the centum/satem split. So this gives us two possibilities: either the satem (eastern) pronunciation was adopted in the old homeland of Indo-Europeans after the mass departure of peoples to the west into Europe who became Celts and Germans, and to the far east by the proto-Tocharians; or the centum/satem split is a west/east split and the west-speaking Tocharians performed a u-turn. The former seems to be the prevailing argument currently. However, the latter is favoured here because Anatolian was the first group to detach itself from the main core of Indo-Europeans and this seems to be a satem group. This would mean that PIE was originally satem. What is certain is that Tocharians did borrow heavily from other languages because we find Sanskrit words they adopted due to their Buddhist religion. Could Tocharian be heavily hybridised in the manner of English with its large French vocabulary, and religious-adopted Latin vocabulary? This group is perhaps the least studied in all [of the] Indo-European macro-family. It consists of two dead languages, Tocharian A (or Agnean) and Tocharian B (or Kuchanian), spoken in the first millennium AD in East Turkestan, in several [oases in which] inscriptions and texts written in [these languages] were found. What in the past were called Aryans are now known as Indo-Iranians and Indo-Aryans - the original term has bad connotations due to its use by the Nazis. They appear to have been the group that remained where they were in the old homeland, in the steppes to the north of the Caucasus. They also appear to have stayed longer than any ancient group in the 'secondary homeland' to the north of the Black Sea, which is just west of their primary homeland in the upper Caucasus. There is some evidence in names to show that people using a language which was related to Vedic and Avesta lived to the north of the Black Sea; and various groups of Iranian nomads also occupied that area for a very long time. The group split into two related linguistic groups, one we call Iranian, and the other Indian; both appear to have lived to the north of the Black Sea (some of the people in this region were known in classical antiquity as Scythians and Sarmatians). In addition to the steppes they expanded into modern Afghanistan, Iran, India, Pakistan, and the hill country of Syria and eastern Turkey. Along the way they integrated themselves into the Oxus civilisation of around 2200-1700 BC and were probably also responsible for the 'spiral cities' of the Kazakhstan steppe. It seems more likely that 'integrated' is correct rather than 'founded'. IE nomads did not apparently build cities; they conquered or infiltrated into a material culture that itself built cities. 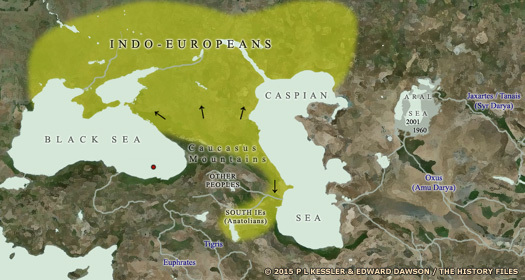 The Oxus civilisation people (indigenes, meaning the original natives of that area, equating to aborigines) were probably in conflict (at war) with the IEs of the Andronovo horizon. In time they probably did become IEs due to IE settlement amongst them, but this would have been in the manner of Greece being occupied by the proto-Mycenaeans: the language may have changed but the gene pool would have remained mostly indigene. As nomads they were quite mobile, ranging as far as China in the east where they were known as eastern Saka (Scythians), to Spain in the west where they were known as Alani (the word is an altered form of Arya). Some of these Alani accompanied the Vandals into North Africa, settling with them in Tunisia. Their language fragmented into dialects just like all the others, but in this case there is evidence of heavy contact with non-IE languages, particularly from other nomads. There appears to have been heavy contact between Alani and proto-Bulgarians. For instance, the ruler of the Alani bore the proto-Bulgarian (originally Mongol language) title of 'khan' (see the link for Proto-Bulgarian Runic Inscriptions in the sidebar). As settled farmers, the Indian group moved into modern Pakistan and India; and the settled Iranians moved into modern Iran, eastern Turkey and nearby areas. One tribe, or dialect group seem actually to have stayed close to the original homeland, and are today's Ossetians. Of great personal fascination to the present author is the fact that one of the Cimmerian kings was named Tugdamme, which is a near-perfect analogue for the name Togodumnus of the Catuvellauni in Britain. Is Tugdamme a Celtic name that was used by the Cimmerians? Or perhaps a Tocharian pronunciation with the same meaning? Tug/Togos is a deity name, more familiar as Dagda and meaning shining like the sun (cognate with the English word 'day'). Damme/Dumnus is often defined as meaning 'world', but far more likely it is a cognate of the Latin Dominus and means either 'dominant' or 'dominated', probably the latter in this case. Celtic name constructions often use a deity name along with other words indicating 'beloved by', 'dog of', 'servant of', etc. In this case it would be roughly 'ruled by' the deity Togos. Were the Cimmerians a group of Thracians or Iranians who were ruled by a Celtic or Tocharian elite? Bear in mind the fact that the timelines given above are conjectural in most cases; the farther back in time one goes, the fewer written records can be used. By necessity the estimates used above are rough - they may be right or they may be wrong - and in either case exact dates seem impossible to prove beyond doubt. What seems certain is that the Indo-Europeans started out as a numerically small group, possibly or even probably in some sort of isolation, who then entered the steppes and at some point became nomadic via horse-drawn wheeled vehicles. From that action alone, the Indo-Europeans can be regarded as possibly the first militarily aggressive nomadic people on the Eurasian continent, and certainly the first successful one. As such they had a terrible advantage over the isolated tribes and organised civilisations that they encountered: they could appear out of apparently nowhere and attack, and if they didn't win could simply roll away in their chariots and carts, out of reach of sedentary peoples to attack again somewhere else or later at the same spot. Not until other nomads such as Huns and Mongols developed and expanded was this advantage duplicated. The Indo-Europeans had mixed success in Asia; but in Europe, with no steppes, they took almost everything they encountered. Indo-Europeans remained militarily aggressive and eventually controlled most of the planet, which was only partially rolled back in modern times as other peoples acquired advanced military and industrial technology. Their contribution to worldwide civilisation has been considerable. Text copyright © Edward Dawson. Original maps copyright © P L Kessler. An original feature for the History Files.